Wow, this is inconvenient, but I kind of forgot I had actually written these tables. So today is going to be catch up's month, with a bunch of stuff that's been written for months mixing brand-new stuff. This is the companion piece that goes with this post. Anyway, you know the drill. These are Chaos and Corruption tables, this time for the Necromancer. Roll on the former for rolling doubles on spellcasting dice, and on the latter for triples. 1- You lose your reflection. You can walk into mirrors if they are big enough for you to climb into. You can also drag people through with you. Magic doesn't work in the mirror world, except for someone like you. If you go through the mirror, the ends of the world are what the mirror sees. 2- You start developing a craving for human flesh. 3- The Wizard becomes convinced that they are locked in a time loop, until someone you know (within an hour's walk) either dies or makes the right choice. 4- You become convinced tomorrow is your birthday. Tomorrow will never come. Anyone who points this out will draw the attention of the Demon feeding on your madness. 5- You become convinced that you are much older than your body, and that everyone around you is a child in an adult's body. 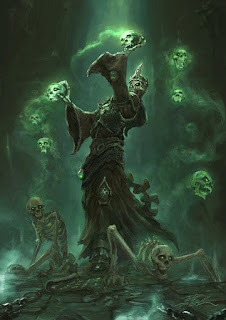 6- The Wizard becomes convinced that the skull of a corpse can talk and delivers sage advice in exchange for sacrifices. 20% chance their actually is a soul still tied to the skull. 7- Corpses reanimate much more regularly around the necromancer, still convinced they are alive. 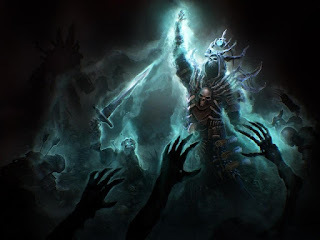 8- All undead recognize you as a Necromancer on sight and try to kill you over all others. 9- The Wizard believes cannot go into an body of water where you cannot see the bottom from the shore, as their is a teleporting monster that tried to drown them long ago, and now waits for them to return to its black domain, so it can finish them. 10- The Wizard becomes convinced that the BOI is trying to capture them and take them back to Blackwood, Virginia. They will avoid any non-descript offices, federal goverment buildings, and Virginia like the plague. 11- The Wizard finds the idea of copulation and reproduction skin-crawlingly disgusting. 12- The Wizard can hear the surface thoughts of all their Undead Slaves. 13- The Wizard can instantly tell what someone's first name is just by looking at them. 14- All healing magic harms you, and all spells that damage because of negative energy or psychic damage heal you. 15- The Wizard does not feel pain. 16- The Wizard never need to sleep. 17- The Wizard becomes convinced that they need to kill humans and distill their spinal-cerebro fluids into an elixir. They believe they will die without this. 19- The Wizard can only sleep securely in a coffin or underground. 20- The Wizard becomes invisible to Undead. 1- The Wizard cannot enter a house or dwelling without permission. If they do, they lose access to 1d6 Spell Casting Dice until they leave. 2- The Wizard starts rotting while they are still alive. 3- The Wizard whenever they are scared or agitated, must save or have their soul ejected from their body. 4- The Wizard's Power is always active, no matter what. Anything they touch with 1 HD must save or die. 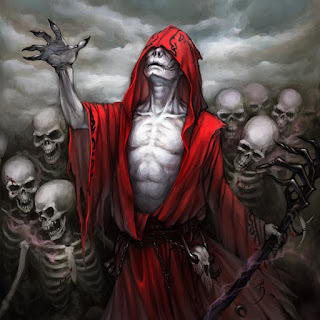 5- The Wizard, whenever they enter a place of great violence, has a fifty percent chance of summoning a ghost. 6- The Wizard, whenever they go to sleep without saying a prayer to Cascrymagog, has a chance of turning the ground beneath them to quicksand. They know they should say the prayer, but not why. 7- The Wizard has a 20% chance of any of their food being contaminated by human remains. Similarly, if they kill someone, their is a fifty percent chance that instead of innards and viscera, there will be a food inside of them. 8- Every time the Wizard kills someone, they get a tattoo. This tattoo describes the circumstances of the murder, the deceased's name, and their face. At night, the tattoos whisper quietly. 9- All beautiful things become less attractive at the Wizard's touch. This effect persists even after you let go. Additionally, it is cumulative. 10- All the Wizard's hair falls out. Out of the hair, 1d12+2 extremely poisonous snakes appear. These snakes, if they bite you, cause you to immediately save or die. 11- The Wizard is confronted by a beautiful musician. The musician will try to get the Necromancer to participate in a musical duel. If the Wizard loses, they will be trapped within the necklace hanging around the stranger's neck. If they refuse, the stranger will understand, leave, then send a band of monsters after them. 12- The Wizard's touch causes all food to spoil. Things that can't spoil will somehow do so. 13- The Wizard's touch becomes charged with life energy. If you die, the last woman they had a positive interaction with becomes pregnant. This is the Necromancer, who has been reincarnated. The Wizard does not know this, and will not realize it until they wake up, fully conscious in the womb. 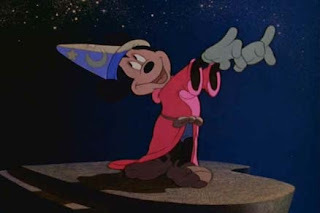 14- The Wizard receives a premonition about their own death. If they try to avoid it, they will be hunted down by agents from the Dark Between the Stars. 15- The Wizard becomes immortal. Every time they would die from HP damage or magic, instead someone near them (another PC/hireling/a pet/an enemy they know) dies instead. They still age. 16- The Wizard becomes ageless. They cease aging. They also become locked in time. They lose all abilities to transfer memories from their short to long-term memory, and they can never gain more HP. Their HP can never rise above its current state. Each new day, the last thing they remember is casting the spell that invoked Corruption. 17- The Wizard becomes haunted. They are being haunted by the ghosts of all the dead cells they have in their bodies. 18- The Wizard develops a sunlight allergy. They take 1 damage for every minute spent in the sun. Clothing is insufficient to protect them. A foot of dirt, an inch of lead, or six feet of wood will do it, though. 19- The Wizard randomly loses control of a body part. This body part starts acting on its own and refuses to obey them. 20- The Wizard develops the urge to kill. Every day if they haven't killed someone, they must save. If they fail, they take -1 to all rolls for the rest of the day. This bonus is cumulative.